X can only pass to unparked attackers. D wchanges who they are markingevery couple of minutes. 2. X receive & run with th ball. Show D1/3, M1/3 & A1/3 by number of players e.g. D 8 v 4, M 2v2, 3v3, A 2v3,3v4, 4v6 etc. always out numbered. Team Spread 5 to 5, end to end. Support = angle & distance. Rest. Keep ball. 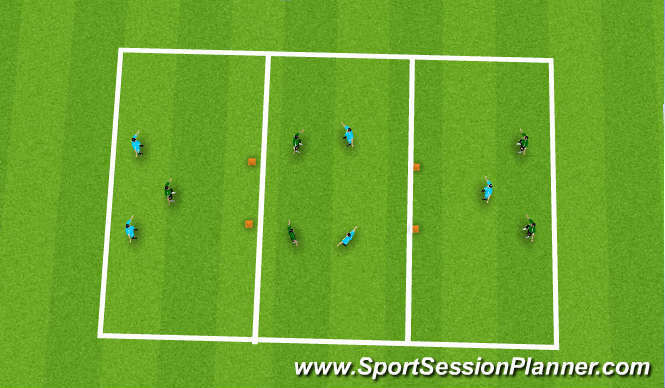 B. show all the above indiviadual skills & team understanding e.g Timing = passes, runs etc. Quality of passing, disguise etc. Reciving & turning with ball. Running with the ball. Dribbling, Moving off the ball. Spread S to S end to end. Support = angle & distance. Overlaps, crossover, 1-2 etc. Disguise. Forward runs when & where. Agility to recive. Balance, anerobic, running,co.ordination. Timing, relating to running & runs needed to break lines. How personality influences our motivation attitude. self control. what type of player do we have. Type 1- often leave jobs unfinished, avoids competition if possible, may compeate if they know they will win. Type 2- indifferent towards competition. Type 3 - Loves competition, especially when the outcome is uncertain. full of energy towards a goal, takes calculated risk, love to win but equally realise losing is not the end of the world, very persistant & highly motivated. Type 4 - enjoys competitive situations, takes personal responsibilities for all out comes, failure causes self doubt and lower self esteem, often poor sports manship, unwilling to take risk. Players found these practices difficult for the first half of the session, the latter half was good. thinking as opposed to reflex action is proving quite difficult to overcome, thinking of making decissions at pace requres many hours of practice.